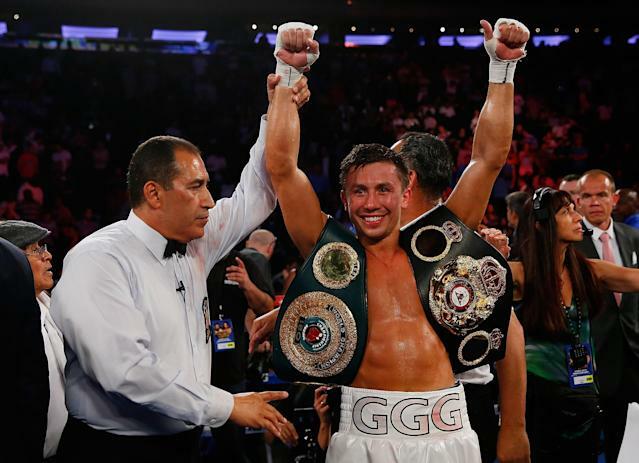 When Gennady "GGG" Golovkin knocked out Daniel Geale in the third round of their WBA middleweight title fight Saturday at Madison Square Garden in New York, the most impressive part of it was what occurred during the fight-ending right hand. Golovkin was out of position, hands down, winding up to throw at Geale when Geale threw a right that landed squarely on Golovkin's nose. Geale is not a big puncher, but the force of the punch pushed Golovkin back ever so slightly and caused Golovkin to momentarily close his eyes. But when Golovkin threw his right in return, he did so with his right foot off the ground. Geale's right had thrown off Golovkin's mechanics, and so he wasn't able to explode off the right like he frequently does and land a crushing shot. Triple-G showed his incredible power, though, by hitting Geale so hard he knocked him down and ended the fight even when his balance wasn't nearly perfect or close to what it should have been. Even though he's 32 years old and Saturday's bout was his 30th professional win in as many tries, Golovkin is still unproven in comparison to some of the hardest punching middleweights who ever lived. Middleweight is one of boxing's glamour divisions and historically some of the game's best fighters and hardest hitters have fought as 160-pounders. Golovkin, who without question has made himself the No. 1 must-see attraction in boxing today, also has to at least join the conversation as one of the hardest-punching middleweights who ever lived. Most experts consider either Bob Fitzsimmons, who fought in the late 19th century and the early 20th century, or Sugar Ray Robinson as the hardest-punching middleweights ever. But men such as Julian Jackson, Stanley Ketchell, Rocky Graziano, Gerald McClellan, Marvelous Marvin Hagler and Carlos Monzon are also in that discussion. Golovkin may well sit behind all of them. But he's proving in each outing that his power is extraordinary and that we ought to at least begin to consider the possibility something very special is unfolding before our eyes. Geale, for instance, had averaged 11.3 rounds per fight over his previous 10 outings, but was stopped in the third by Golovkin. Now, Golovkin has fought the best opposition available to him, but not the best that is out there. Miguel Cotto holds the WBC middleweight title, which he won by stopping Sergio Martinez in June. Cotto, who fought most of his career at 140 and 147 pounds, had an exceptional performance against Martinez, but it's hard to imagine he could stand up to Golovkin's power. 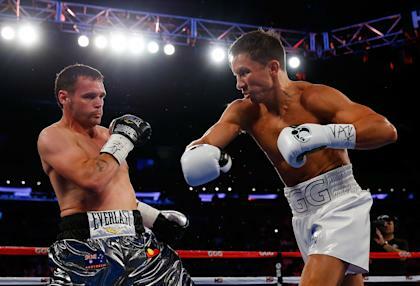 Golovkin's jab is often a power shot because it lands with such force, snap and authority. Perhaps the most fascinating fight that could be made is one that almost certainly won't be because of network obligations. Golovkin is tied to an exclusive deal with HBO while Canelo Alvarez is in the middle of an exclusive deal with Showtime. 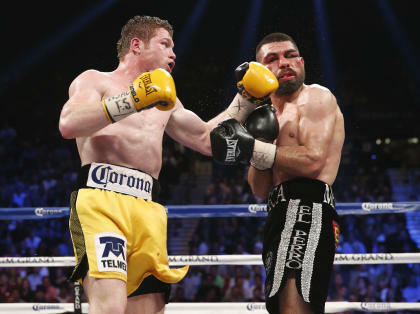 Alvarez, who himself is a good puncher, is a big super weltweight and a move to middleweight is only a matter of time. Andre Ward would be the fight to make for Golovkin, but Ward is in the midst of a legal dispute with promoter Dan Goossen that has kept him inactive for way too long. Golovkin is a middleweight who makes the 160-pound limit without much difficulty, so Golovkin shouldn't have to go hunting for an opponent, but because of the dearth of quality and/or makeable fights, Ward presents the best option. But come September, Ward will have fought exactly once in two years and with each passing day, his value diminishes. Golovkin remains active and is seemingly getting better each time out. He was a bit ragged against Geale, however. His punches weren't as crisp and as straight as they often are and he allowed himself to be tagged more than he usually is. The two times he connectedly solidly with Geale, Geale went down. By any standard, Golovkin is a power-punching middleweight. By the time he's through, he may be remembered as one of the most fearsome 160-pound boxers who's ever lived. And given the number of greats who have fought at middleweight, that is saying a mouthful.